Brother CS6000i Vs Singer 7258 - Which One To Pick? If you want to start a sewing hobby, or even go full professional, there are two brands to seriously consider. They both have a good track record of producing quality sewing machines, and they are at each other’s throats, which is good for you as you will get more features for lower cost. Behold the wonders of the free market in the sub $250 range! Should you choose the Brother CS6000i or the Singer 7258? What are the differences between them? The first thing you will notice is that, although both are very affordable, the Singer 7258 is considerably costlier than the Brother CS6000i, by about 55%. Let us consider why that is, and would it be worth it to pay extra for what it offers. 5 Which One to Pick – the Singer 7258 or Brother CS6000i? The range of stitches is the most prominent feature focused on in the marketing of sewing machines. Singer 7258 offers 100, while CS6000i offers 60. That’s quite a difference, but is it really meaningful? After all, although 100 is a nice rounded number, 60 is a pretty high number too. It all depends on what kind of stitches you need? Of the Singer 7258’s 100 stitches, 76 of them are decorative stitches, while of the Brother CS6000i’s 60 stiches, only 20 are decorative. That makes it very clear. The Singer is laser-focused on decorative designs, while Brother is more of an all-rounded sewing machine. Let’s break it down even further so you know exactly what kind of stitching range you can expect for each model. Hopefully, you have some idea on what kind of sewing work you will be mostly doing, since that will determine which sewing machine model is more suited to your purpose. The Brother CS6000i is definitely more rounded and practical, despite lacking 40 stitches. On the other hand, the large focus on decorative stitching offered by Singer 7258 might be something you can’t miss out on. In the end, both are capable for a wide range of sewing work. Once you get into the flow of sewing, the raw speed factor of the machine comes into play. 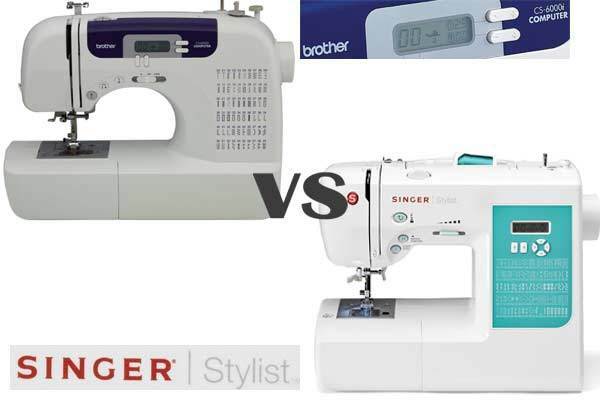 Brother CS6000i is rated at 850 stitches per minute, while Singer 7258 is rated at 750 stitches per minute. That’s somewhat surprising considering the stark price difference between the two, and may be the deciding factor if you care about the raw power. However, both machines have equally implemented speed control that allows you to fine-tune your sewing pace. Still, in the long run, that 100 less stitches per minute may become a drag once you become an experienced sewer. If you take a look at some of the Youtube videos of both models, you will find it difficult to discern any noticeable difference in noise levels. Of course, the as we mention in our Brother CS6000i review, it offers higher stitching speed so it may be slightly noisier when you push the pedal to the metal, so to speak. Either way, you get a comfortable level of noise for both, definitely a vast improvement over the overbearing noise produced by sewing machines of the previous generations. In terms of practicality, unsurprisingly, the Brother CS6000i wins once again thanks to its generously wide table. You will find it very useful when you have large, thick fabrics. It’s strange that the Singer model doesn’t have an equivalent feature considering how much more expensive it is. No matter, the Singer 7258 does come with a cover for the feed dog, which comes in handy for some smaller quilting projects. Also, bear in mind that Singer comes with a training manual you can find in our Singer Stylist 7258 review, while Brother CS6000i doesn’t have any. However, this may be irrelevant since both are very popular models, meaning that you can find a huge range of tutorials and tips for both on Youtube. This may be subjective, so take it with a grain of salt, but the design itself of the Singer 7258 is more pleasing to the eye. It’s more stylish and uniform in its overall appearance, with a bright cyan accent, compared to the Brother CS6000i which is more utilitarian in its appearance. In any case, although no one ever said that a sewing machine should be portable, it might be useful to know that there is a significant difference in weight as well. Brother CS6000i is on the smaller side, at 13 pounds, while the Singer 7258 weighs 19 pounds. Additionally, the stitching width on the two models is slightly different too. This seemingly minor difference will become important as you advance to higher levels of sewing mastery. Brother CS6000i has a 7mm stitching width, and Singer 7258 stitches at 6mm width. Which One to Pick – the Singer 7258 or Brother CS6000i? When it’s all said and done, which sewing machine would be the better option? Unfortunately, no one can decide that for you since only you know what you will use it for. If you want a faster, cheaper, more practical sewing machine, suitable for quilting and regular sewing work, then pick up the Brother CS6000i. If you have your mind already set on the more advanced decorative stitching and delicate work, then pick the Singer 7258.